Since 1996, Public News Service has pioneered a model of member-supported journalism to engage, education and advocate for the public interest. By combining legacy and new media, we reach audiences across geographic and political divides. Currently, tens of thousands of media outlets receive our content and more than 6,000 nationally are regularly using our stories. Our members are organizations � NGOs, Foundations and Social Enterprises � and individuals that help �fund a beat,� covering critical issues that receive too little coverage, lifting up often marginalized voices and making greater journalistic breadth available to broadcasters and publishers on any platform. 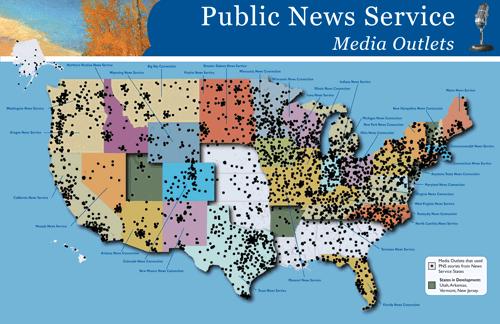 Currently, Public News Service manages independent news services in 37 states, reaching a daily audience of 30-50 million. On a day-to-day basis we link with hundreds of grassroots organizations who keep us informed on a cross-cutting range of social justice, environmental and economic issues. We�re a national news service with local impact. Our journalists are on the ground, and welcome your help and input. Click here to find the producer in your area. Contact us to learn more about membership, and support coverage of the issues that are important to you. P.S. Learn about our sister nonprofit Media in the Public Interest, and our native advertising platform, SoundBite Services.